In banning gay conversion therapy, Ireland would futher distance itself from the acceleration of turmoil and hate in a fractured world. In 2014, Edward McCann and Danika Sharek from TCD and UCD published a survey of LGBT+ experiences in Ireland’s mental health services in the International Journal of Mental Health Nursing. One element of their survey addressed negative experiences, with 29 per cent reporting a negative reaction when they disclosed their LGBT identity, 21 per cent reporting comments that their identity was “just a phase”, and 13 per cent receiving advice that their orientation could be changed to heterosexual. We’ve got so much to talk about in this month’s issue, we’d better get started! 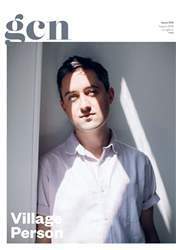 Leading the charge is our cover star Conor O’Brien, the voice behind The Villagers. Conor dropped in to talk about their new album and what it’s like being an out gay man in the business. On a further musical note, Irish electro band Eden celebrate 20 years in the industry. They had many a tale to tell and GCN was delighted to listen! The GAZE film festival takes over cinema screens this month so we caught up with Desiree Akhavan, the writer and director of the much-lauded gay conversion therapy film The Miseducation Of Cameron Post, along with the creators of the essential documentary Outitude, detailing the history of Ireland’s lesbian community. On a more serious note, Evgeny Shtorn details his escape from Russian persecution only to be caught in the bureaucracy that is Ireland’s Direct Provision System. Plus Jamie Brady provides a hard-hitting photo essay on the effects on Grindr on the young male psyche. With all that awesome content on offer, you better start reading now! Win a seven-night Mediterranean Cruise!